A program in Colorado called ‘Granny Does Graffiti’ arose from the concept that both street art and memory are fleeting. Programs such as these explore memories and pathways in the brain for creativity and engagement1. 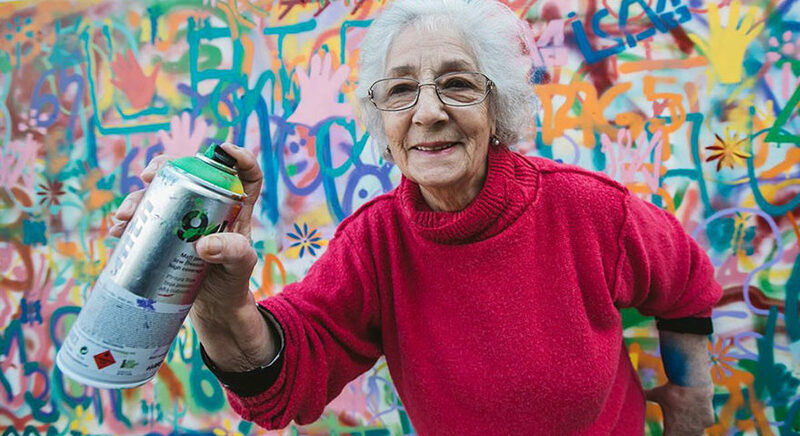 It challenges stereotypes of people living with dementia and graffiti artists and encourages people to leave their mark – shapes and symbols to represent themselves1. This amazing project inspired ‘Well, I’m still the Diva’ study. Graffiti is drawings or writings on surfaces in public view – usually illicitly – and often negatively associated with youth culture. However, the emerging popularity of artists such as Banksy shows graffiti to be a medium to express social messages and to challenge ideologies2. Well I’m still the Diva pilot study used graffiti as a means of self-expression for people living with dementia as they explored their changing identity. Their street art and tag was displayed in a public space in Bournemouth, UK, and the artists invited to discuss the meaning of their artwork. Hicks, B., Carroll, D., Shanker, S., & El-Zeind, A. (2019). 'Well I'm still the diva!' Enabling people with dementia to express their identity through graffiti arts: Innovative practice. Dementia (London, England), 18(2), 814-820.